In the Powell Street BART station, a voice that slides from cartoonishly daft to deeply sullen is telling the story of the Three Billy Goats Gruff. There is the bridge, and there is the troll, but these are not your usual billy goats. One is a gamer, one is an emo kid, and one is a jock; and the voice takes immense pleasure in splitting itself up between them and having a mad conversation between three different versions of itself. It's only when you turn the corner that you see the voice belongs to a young man mostly hidden behind a ramshackle puppet booth. Miniature billy goats wobble past his face, and the ground is littered with sets of folded cardboard that he tosses aside when the story moves from one place to the next. 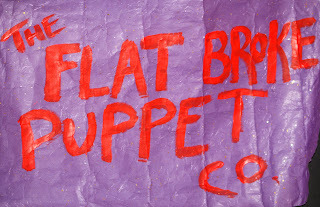 A sign identifies the production as an enterprise of the Flat Broke Puppet Co. This is Nick. He has long hair stuffed under a baseball cap and narrow, surprisingly elegant hands that dart and gesture almost constantly when he talks. He's from Rhode Island, but he ran away from home when he was 16, hitchhiking all the way to L. A. "It was horrible," he says. "A pit." He made his way north and he discovered that San Francisco was different. There were so many things he liked about it. "It really matched me. I liked the people... and I liked all the pot, of course." He started doing a bit of puppeteering, but he was young and he fell into the seedy traps of the city, the drugs and prostitution. "I got cleaned up, though," he says, and when he did, he did an internship at ZEUM, a children's museum. He worked at the kids' theater and had the opportunity to meet Wendy Morton, who specializes in shadow puppetry. From there, he went on to work with Basil Twist, a master puppeteer whose work is both stunning and strange. For a while, he tried to live a normal life. "I thought: normal people have normal jobs. I tried that, but it was a huge failure." So he continues with his puppets, sometimes working with a musician who plays the concertina and whose name is Fable. "The thing about puppets is that I don't have to be seen. I don't have a good stage presence, so when it's me trying to be onstage..." He rocks back and forth on his heels, jerking his body from side to side. "I get like Rain Man, basically. 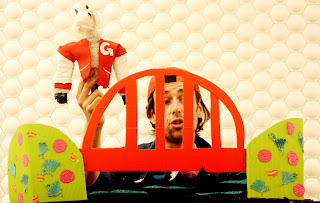 With puppets, all my energy that's not the voice is going into them, so people don't see me." Powell Street BART station, near the exit to the Westfield Shopping Centre. On Montgomery Street, near the Palace Hotel, in front of a tailor shop. On Valencia Street, especially when he has more "hipster" material. In North Beach, which is where he takes his "adult" puppet shows. I love this new blog/ project already. Amazing. Aw. Thanks! We're having fun with it so far too. Coming soon (hopefully): a poet, an opera singer, and a bluegrass band. okay, this is an amazing profile.